Zach Zehnder didn’t set out to write the next great guide to Christian discipleship. While the 2004 graduate of Concordia University Wisconsin’s pre-seminary program certainly maintained a respectable academic standing during his time at CUW, Zehnder asserts that writing has never even been one of his strong suits. 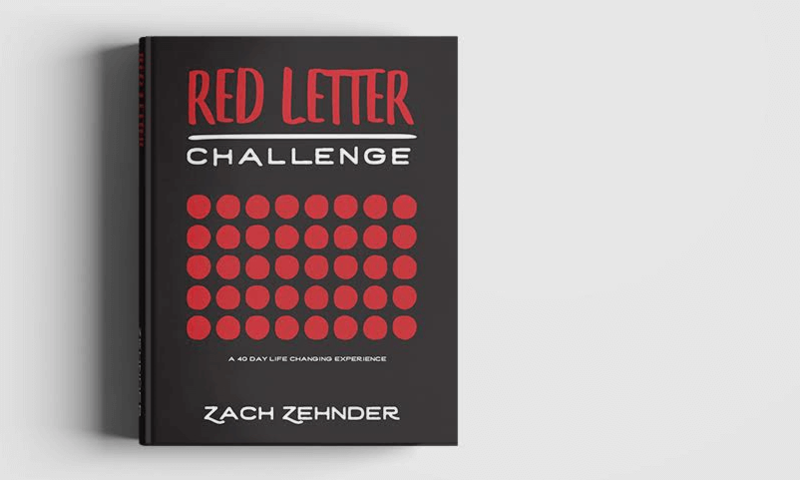 To be fair, Zehnder is quick to clarify that the wisdom and success of his book, The Red Letter Challenge, should be credited to the one whose words inspired it. Since the January 2018 launch of The Red Letter Challenge, over 30,000 copies have been sold, and its popularity continues to escalate. Already this year, more than 100 congregations have latched onto the 40-day campaign, with 51 of those congregations setting aside the season of Lent for the challenge. Because of the demand, Zehnder has worked to come alongside the tens of thousands of individuals who are being impacted by the book during the Lenten season in particular by posting supplemental daily videos on The Red Letter Challenge Facebook page. There are also plenty of other resources on Facebook and Instagram for you to check out if you’re interested in participating in the discipleship craze that’s sweeping the nation. Allison (Buck) Zehnder and Zach Zehnder, both 2004 CUW graduates, and their sons, Brady (left), and Nathan. For those who haven’t heard of it yet, tell what The Red Letter Challenge is all about. As I spent time studying what Jesus says in God’s Word (those words written in red in some versions of the Bible) I found that a lot of what He asks us to do can be summarized into five main principles: being, forgiving, serving, giving, and going. And so I’ve structured the book around those five targets. When did the idea for The Red Letter Challenge start? I planted a church in 2010 straight out of seminary, and I had a core group of people that were awesome in so many ways, but struggled to get outside of their comfort zone. So I began to try to think of creative ways to move an entire congregation or group to be more like who God called us to be. I honestly didn’t have a better answer than to say, “Let’s look at what Jesus said,” and over the course of about seven years, we started to compile the content for Red Letter Challenge. Why do you think it’s been so well received? I think churches and pastors struggle to find practical content for their congregants. That’s why Red Letter is going so well I think, because of the simplicity of the idea—again, it’s not mine, it’s Jesus’—to hear and do what He says. And that, at the end of the day is what it’s all about. You’ve noted that a lot of congregations are taking on the challenge during Lent. Was that your intention when you wrote the book? Not specifically, but it makes sense. I think the 40 days of Lent and the 40 days of the challenge fit nicely together. With the Lenten season being about self-examination and being about reflecting on Christ’s sacrifice, we’re examining Christ’s Words in light of what he would have us do. It’s a pretty common practice for people to give up something for Lent, but then they go right back to it after Lent is over. That’s fine, but I thought a better opportunity would be to pick up a new habit. And that’s what Red Letter presents is an opportunity to pick up a new habit that can hopefully endure long after Lent is over. What are some of the stories you’ve heard about how people have been impacted by the book and their participation in the challenges? From both an individual and congregational standpoint, we’ve heard a lot of really encouraging stories. In the week of forgiving, for example, I’ve had several stories of relationships that were closed because of sin and bitterness, and Red Letter Challenge has helped reopen those conversations and, in a sense, restore relationships. Or hearing stories about people who have fasted during the week of being—it’s just been amazing to see how many people have never fasted and by doing that God has shown them something or they’ve made it a practice in their life. There’s honestly stories like that every week. What’s next for Red Letter? I’ve heard stories of pastors who have surveyed their congregation and have gotten somewhat objective data about where they’re strong and where they’re weak according to the five targets, and so then future sermon series or initiatives are being formed to complement their church’s strengths but also fill holes where they’re weak. As a result, we’re working to create a free, online assessment where anybody can measure themselves according to the five principles of The Red Letter Challenge, and then we’ll work to give them some good next steps to keep going with their strengths or fill holes where needed. Hopefully by end of summer that will be out on our website. One of the other things that we’re hoping to have come out this summer is a project my wife has actually done a lot more with than me. We’re coming out with a Red Letter Challenge kids’ workbook. 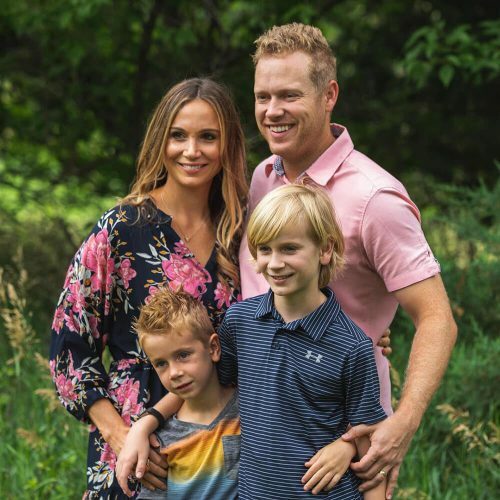 She’s taking her degree from Concordia (Allison (Buck) Zehnder graduated in 2004 from CUW with a degree in lay ministry) and her knowledge of kids’ ministry and we’re teaming up with some really great people to produce that, because we believe kids can do the things that God calls us to do as well. How did Concordia help prepare you for this point in your life? I think Concordia really gave me the confidence to both speak and write God’s Word effectively and to know that I can feel good about the product I put out there and confident that it’s going to honor God’s Word. There were a lot of writing for assignments for Concordia and I’m not even saying I got the best grades on those—I don’t even consider myself a writer—but just the encouragement I received from professors to keep going and get better was tremendous. The idea that we’re all striving for something even if we don’t know yet that God will use it one day in a mighty way. Follow The Red Letter Challenge on Facebook (/RedLetterChallenge) and Instagram (/redletterchallenge). Learn more about the challenge, including where to purchase a copy of the book, on their website: redletterchallenge.com.